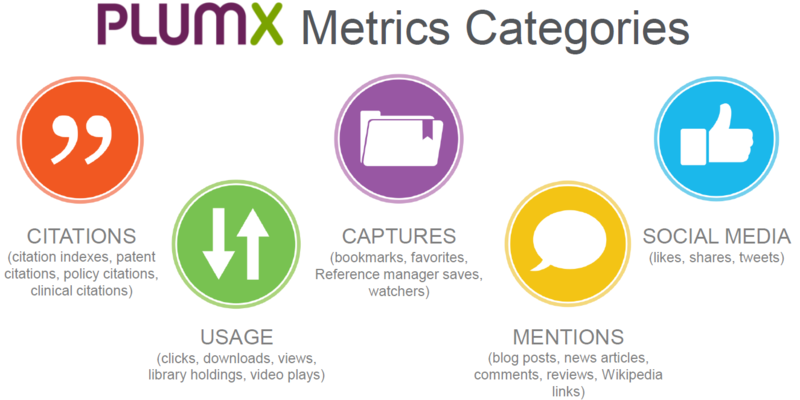 PlumX Metrics – already available on Scopus records – are comprehensive, item (article)-level metrics that provide insights, beyond traditional citation metrics, into the ways people interact with individual pieces of research output (articles, conference proceedings, book chapters, and more). Now, PlumX Metrics are also available via the PlumX API for Scopus customers for deeper and more flexible benchmarking and analysis purposes. When Scopus customers access the API, they will receive a set of metrics for Scopus documents, including citations, usage, captures, mentions and social media. More information about this API can be found on the Elsevier developer site. Learn more about PlumX Metrics on Scopus. With Elsevier’s recent partnership with Impactstory, a nonprofit that creates online tools to make science more open and reusable, researchers are now able to discover millions of peer-reviewed open access (OA) articles with ease. The OA movement has made it possible for scientific research to become more widely available. But while OA articles are free to access, they are not always easy to find. Scopus users have been able to locate OA content by filtering results for articles published in journals designated as open access, but now that scope has been significantly widened. Scopus has now broadened users’ ability to discover open access content thanks to a new partnership with Impactstory, a nonprofit that develops online tools to promote open science. Where will they be located on Scopus? How do they help Scopus users? From the document results page on Scopus (once you have conducted a search), you will have the option to click on “View XXXX patent results”. This will open a new screen that will show the patent results based on the search string. 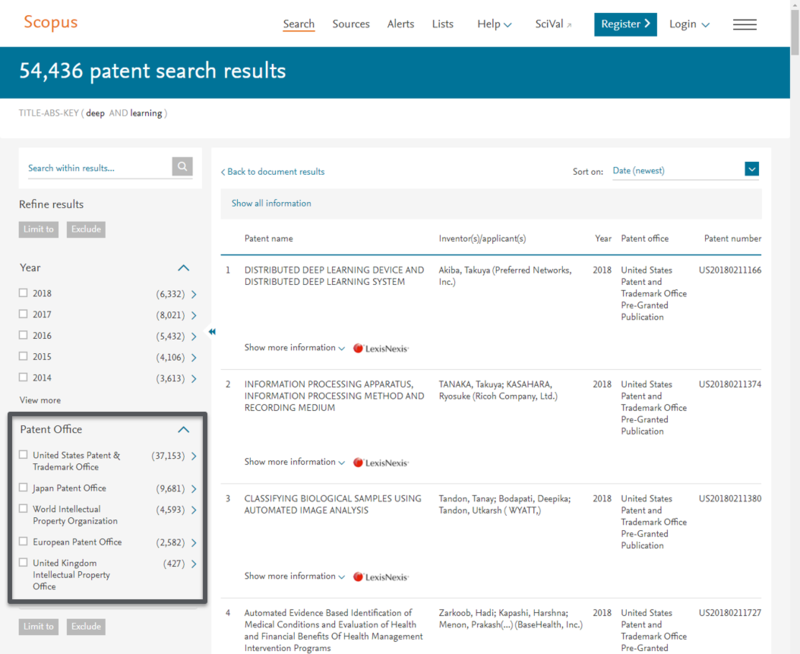 The patent search results will have a side bar on the left side on the screen to refine the search results. From the refine results facets on the left, there is now an option to refine the search results on Patent Offices. A column for Author IDs will be added in the document export options for CSV and TXT. This column will contain the author profile IDs of the authors for the exported references. The current Author column provides only full names. The addition of Author IDs will make it easier to confidently determine the author(s) of an article. 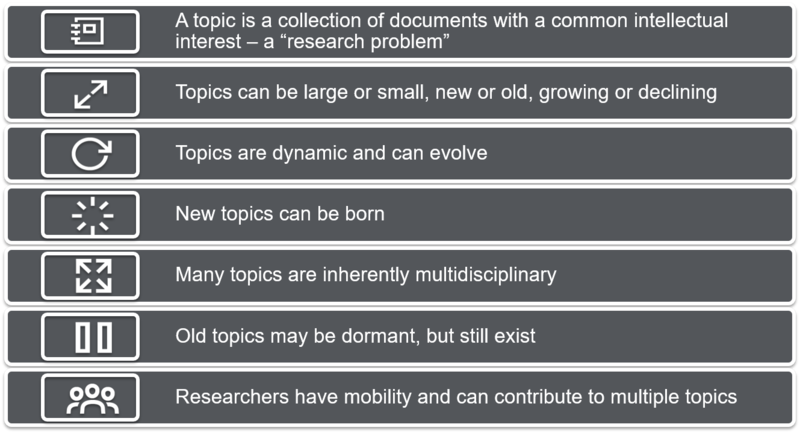 It seems to get harder and harder to be a researcher, not least because of the ever-growing volume of studies being published. You’re under pressure to keep up with all the latest findings (not only in your own discipline but often in others that might impact your work). And it’s not enough to know about specific results and scour huge volumes of data; you need an overview of the trends, emerging data sources and potential collaborators. All of this while also managing your career. It’s exhausting; just imagine if you had to do it manually. Luckily that’s not the case: there are tools, platforms and databases you can use to stay on top of the information and not get overloaded. Like Scopus, the world’s largest abstract and citation database of peer-reviewed scientific literature. We are excited to announce a new tool, the Institution Profile Wizard, now available on Scopus. The Institution Profile Wizard allows institutions to modify their affiliation profiles and correct their organizational hierarchies to ensure the correct set of affiliation profiles are grouped together and displayed on Scopus. As Scopus institutional publication data is included in various ranking methodologies (e.g. Times Higher Education World University Rankings, QS World University Rankings), this tool allows for greater accuracy when reporting institutional data. Scopus publication and citation data also powers SciVal. To get started, please fill out and submit this form. This will allow us to connect you with your local Scopus account team. Please note that in order to access the Institution Profile Wizard, users (no more than three per institution) will have to provide a signed authorization letter from the institution (the letter will be provided upon submitting this form). First released in December 2016 – and steadily optimized based on user feedback since then – CiteScore™ metrics have established a brand new standard for measuring journal citation impact. Powered by Scopus, CiteScore’s set of metrics evaluate serial citation impact over a three-year period. Now the CiteScore 2017 metrics are available, revealing the latest annual assessments of thousands of scholarly publications. Comprehensive coverage: Available for 23,350+ titles on Scopus—including peer-reviewed journals, trade journals, book series and conference proceedings—in 330 disciplines, CiteScore covers 12,000+ more titles than the leading competitor. With the best coverage of abstracts and citations across disciplines and the globe, Scopus is well-positioned to enable users to analyze the research landscape—and CiteScore is one of the latest research metrics available for this purpose. CiteScore metrics, which measure the impact of thousands of journals by calculating the average number of citations per article over a three-year period, can help researchers determine which journals they most want to publish in. The CiteScore 2017 values are going to be released soon and will provide an informative overview of the over 22,600 scholarly journals that are indexed in the Scopus database (the CiteScore 2016 values can be found here). While this annual scoring is very insightful, what if you want to get a more immediate look at a journal’s performance? That’s where CiteScore Tracker comes in. Scopus is considered the Gold Standard for research assessment and evaluation purposes by 4,500+ universities and 150+ leading research organizations worldwide. 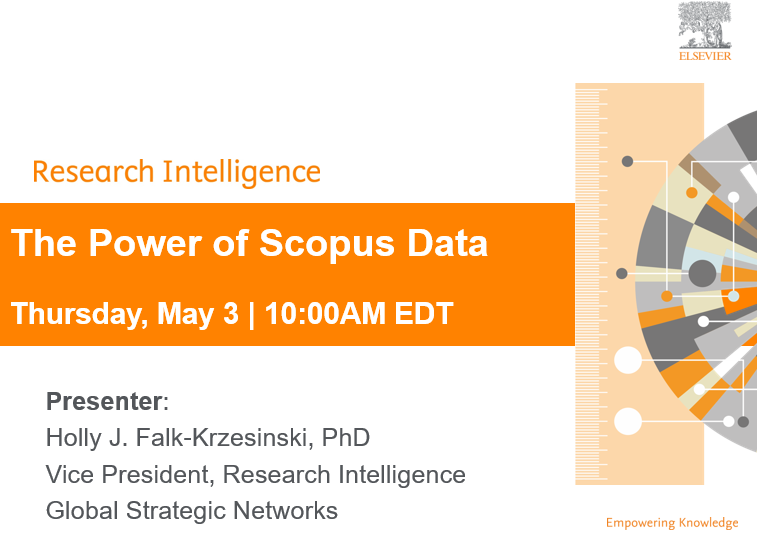 Join as us we discuss the richness of Scopus data and the value it provides for data-driven insight. An improved way to check your Scopus Author Profile! We are excited to announce the redesigned Scopus Author Feedback Wizard, enabling users to easily review their Scopus Author Profile and submit corrections. Your Scopus Author Profile (automatically created by Scopus) showcases various indicators including number of citations, publication history and h-index. These metrics may be used for tenure, funding and for other research performance based decisions; therefore, it is important to ensure your profile reflects your information correctly. Despite the sophistication of the algorithmic profiling used by Scopus, algorithms cannot always match all documents to a single profile with 100% accuracy. That is why the Scopus Author Feedback Wizard allows you to review your Scopus profile and submit feedback. Even if you do not have access to Scopus, you can still review your profile and submit corrections, making sure that the correct papers are associated with your preferred profile name. Read more about An improved way to check your Scopus Author Profile!